While touring SE Europe with a group of friends during the 2010 World Cup, we came across some great hiking in the deep Vintgar gorge in Slovenia. 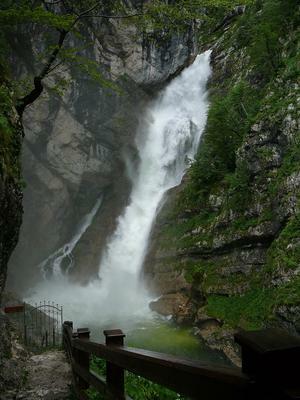 The next valley over contains Bohinj Lake, whose biggest inflowing river is the Savica (Sa-veet-sa). These falls are just a bit up from where the river enters the lake. There is a bit of a hut from which this picture was taken. The mist from the falls when they’re running strong (as in this picture) will soak anyone who goes down the steps to the locked gate below.